Research and innovation are the engine of growth. The R & D department has a key role in achieving innovation and cutting edge patents as always in the history of ROSSS. ROSSS creates innovation and implies Patents collaborating with important Italian and foreign Universities. ROSSS is the only Italian company in its sector to have inside an efficient and modern laboratory. ROSSS verifies the absence of radioactivity in each supply of purchased steel. 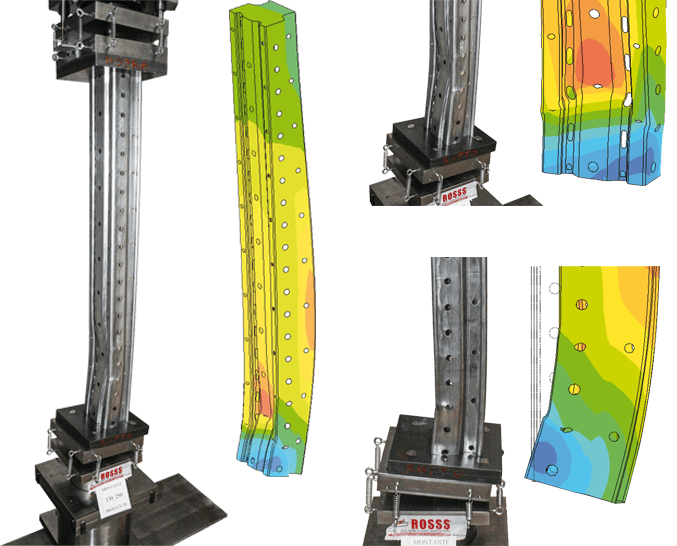 Uniaxial and biaxial bending tests on pillars. Stiffness tests on the current connections. Tests for the identification of distorsional, torsional and flessotorsionali phenomena in axial compression scheme and multi-axial bending. Stub Column Tests for the identification of local instability phenomena. Tensile tests on steel specimens. Live load tests on light shelving. Comb shaped shelving which can be moved obliquely on rails. Modular shelf for shelving units. Shelf for new market shelving units.